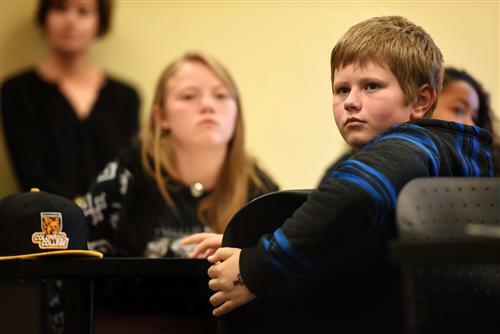 Fifth-graders from schools across District 49 competed in a regional reading challenge April 14 at Colorado College in Colorado Springs. 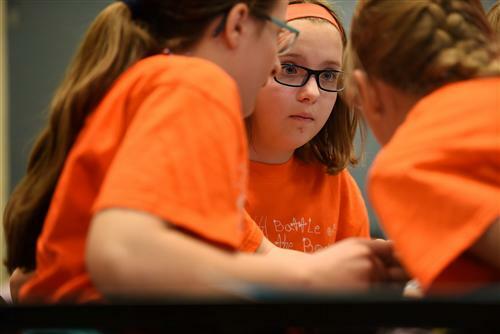 Battle of the Books brought together 100 district students at the college campus, where they’d complete against nearly 700 other fifth-graders, representing Pikes Peak-area school districts and private schools. The struggle over showing character knowledge and story comprehension spanned 40 titles. “I always loved reading,” said fifth-grader Kristian Nay, 10, sitting in Armstrong Hall with a team from Evans International Elementary School, ready for the morning’s second round. He had read through about 35 of the books, while striving for one per week for several months. As the children reached over sturdy tables, leaning in on padded folding chairs — the worn drop ceiling, the blue-patterned carpet tiles — for many, it was their first college experience. As they walked down the corridors, rooms were listed as places for exploring philosophy and world languages. After an official read each book title, Kristian’s team carefully listened to the question about its story. As soon as they recalled the related context, they’d twist their wrist, moving a steady thumb from down to up. They didn’t earn enough points to clinch a medal, but Kristian wasn’t too disappointed. “When I saw this was an option, I had to take it,” said Kristian, proudly sitting beside a black and gold cap with the Colorado College ice hockey team logo. The Tigers had just announced their 2016-2017 hockey schedule, which featured three NCAA semifinalists. He had been talking about touring the Tigers’ turf up until the evening before the competition, according to mother Coral Krueger. She says Battle of the Books gave him a keen sense of motivation, something to work on with self confidence and purpose — “it pulled him out of his shell,” she says. Ahead of the third round, fifth-grader Lily Lyons, 11, was feeling pretty good. Her team from Springs Ranch Elementary School had collected 140 points. Everyone had read all 40 books. Last year’s fifth grade class got them excited about the battle, characterizing it as “fun with a field trip at the end.” They excelled the week before at the district level event. Lily got the reading list soon after it was published last May, and read all 40 books during summer break. When school started, she read them again, one per week. Lily was determined to help her five-person team defeat the 157 others. Lily isn’t a crammer, she’s a planner, says Lyons. The day before the regional Battle of the Books, she was folding her clothes and confirming who’d drop her off at school. Lyons was feeling pride in the amount of teamwork that participating in the event instilled in her otherwise independent, courageous, creative and outgoing daughter. “While participating on a team, she’s focused on a common school goal,” said Lyons. She’s also focusing less on comics, like Japanese manga, DC Comics’ Flash and of course Marvel’s Quicksilver. Ahead of round three at the college, she was thinking about rereading “A Single Shard,” by Linda Sue Park, “Cryptid Hunters” by Roland Smith and “Ruby Holler” by Sharon Creech. Netting 60 points in the final round, her team tied in fourth place. First was earned by Pioneer Elementary School in Academy School District 20, followed by Broadmoor Elementary School in Cheyenne Mountain School District 12. Third place was a four-way tie, including a team from Ridgeview Elementary School in District 49. With the Battle of the Books complete, Lily is eager to read CS Lewis’s classic fantasy series, “The Chronicles of Narnia.” The competition put on her bookshelf “The Magician’s Nephew,” which explained Narnia’s origins. Two titles get added each May to the battle’s list, as two are dropped, according to Katie Poulsen, Evans International Elementary School fourth grade teacher and Battle of the Books registration chair. 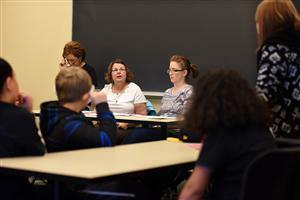 A group of teachers from around the region volunteer their time year-round to put on the event. District 49 schools in this year’s Battle of the Books included: Banning Lewis Ranch Academy, Evans International Elementary School, Imagine Classical Academy Indigo Ranch, Meridian Ranch Elementary School, Odyssey Elementary School, Pikes Peak School of Expeditionary Learning, Ridgeview Elementary School, Remington Elementary School, Springs Ranch Elementary School and Rocky Mountain Classical Academy. The 2016-2017 school year’s Battle of the Books reading list is scheduled for release next month.